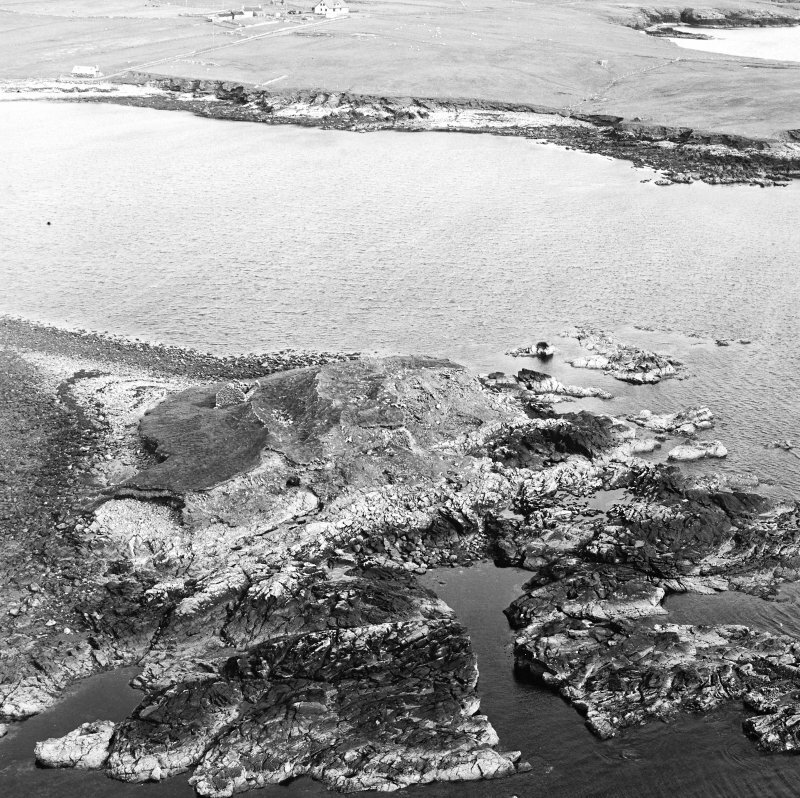 Oblique aerial view centred on the remains of the broch with the ruin of the building adjacent, taken from the W.
Oblique aerial view centred on the remains of the broch with the ruin of the building adjacent, taken from the N.
Oblique aerial view centred on the remains of the broch with the ruin of the building adjacent, taken from the SSW. 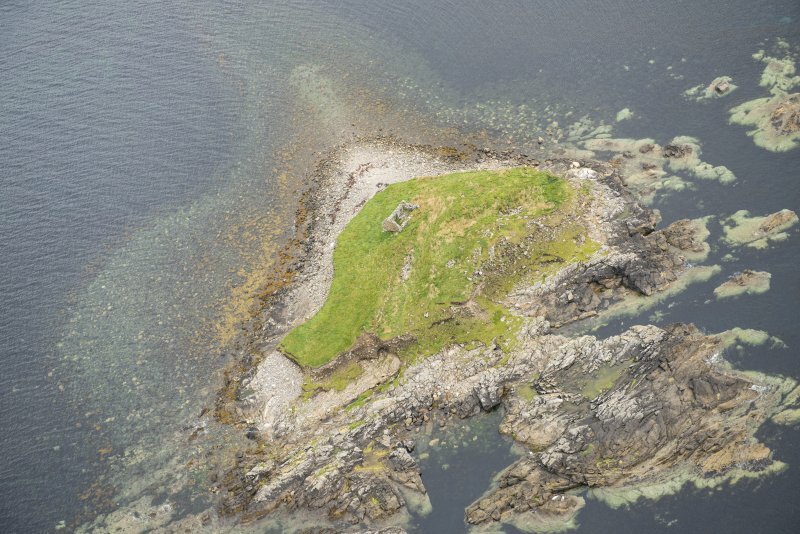 Oblique aerial view centred on the remains of the broch with the ruin of the building adjacent, taken from the NW. 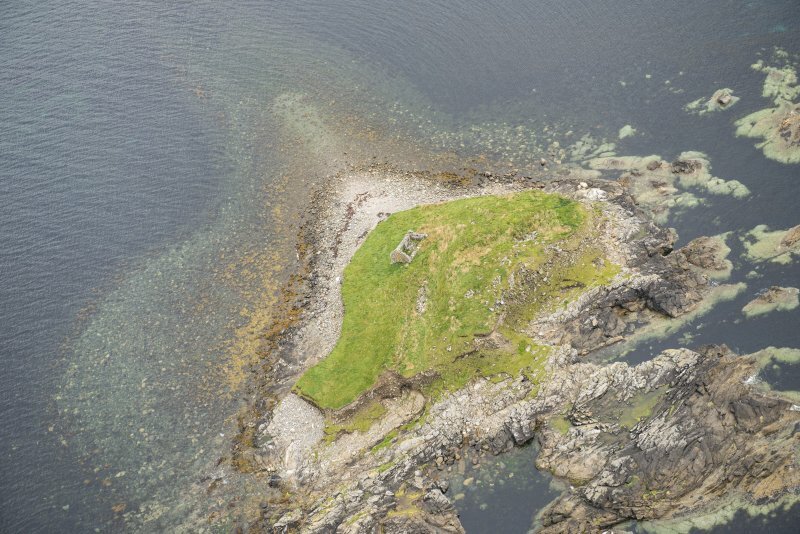 Oblique aerial view centred on the remains of the broch with the ruin of the building adjacent, taken from the NNE. 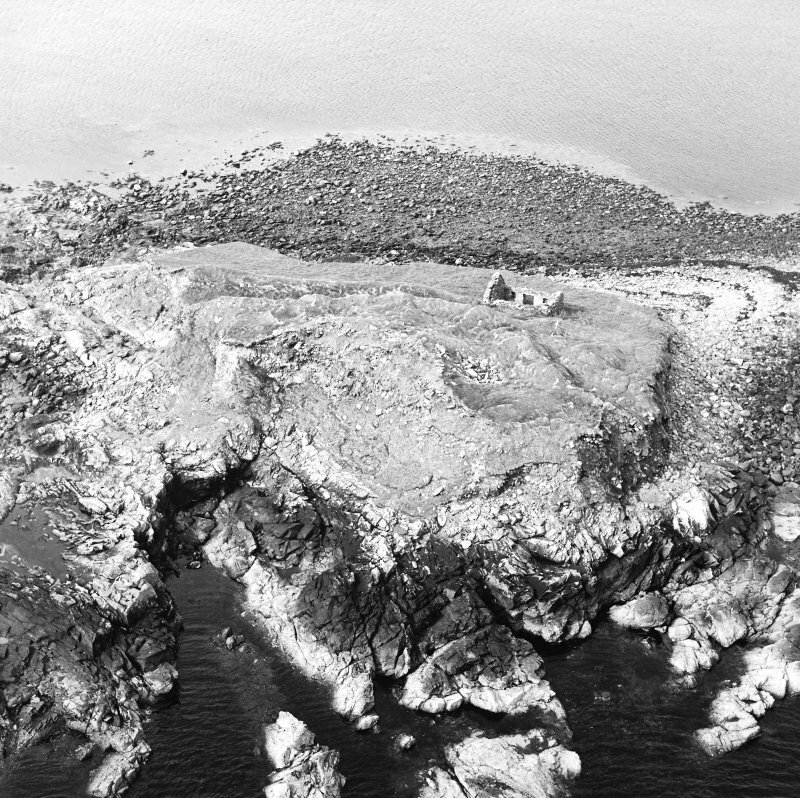 Oblique aerial view centred on the remains of the broch with the ruin of the building adjacent, taken from the WSW. 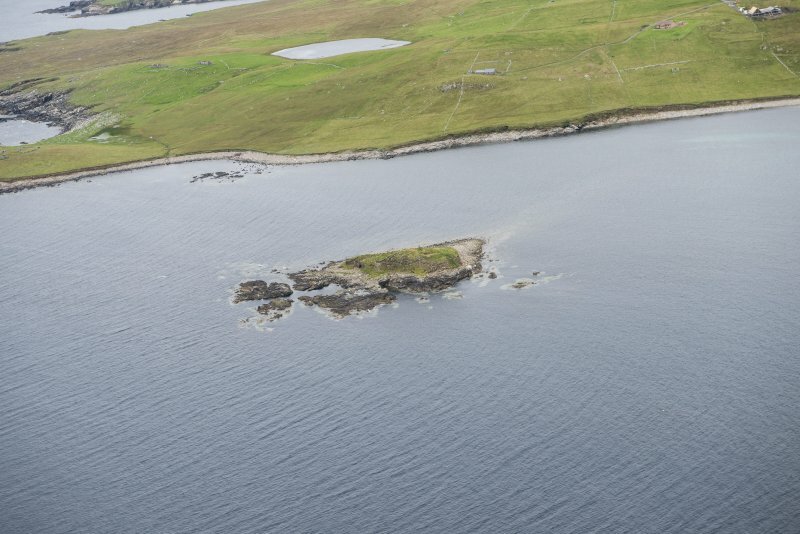 Oblique aerial view centred on the remains of the broch with the ruin of the building adjacent, taken from the NNW. OS 6" map Shetland, 2nd ed., (1900). 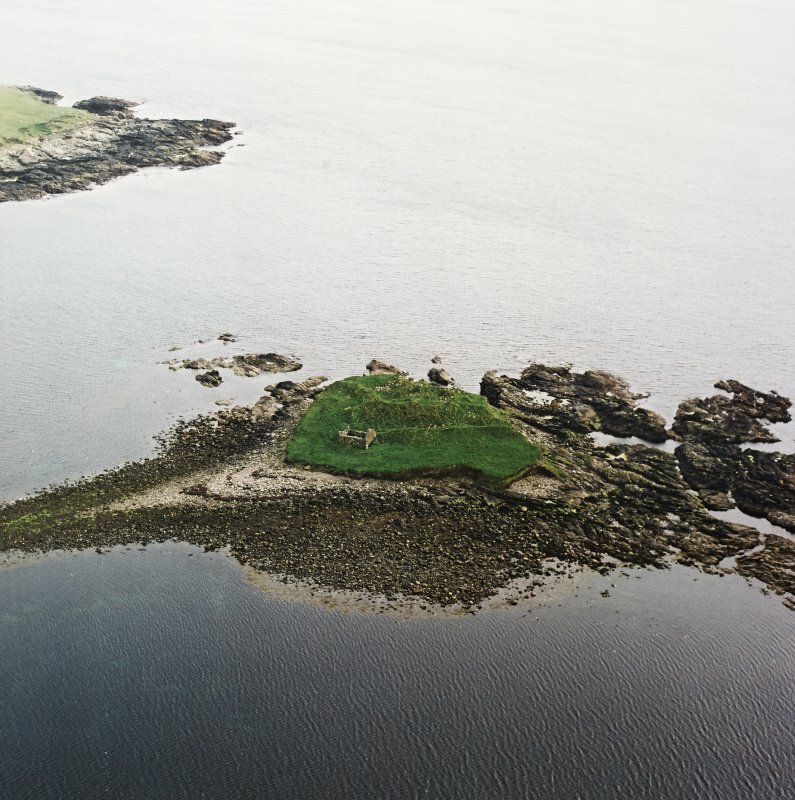 A broch, surrounded at a distance of about 21' by a massive defensive wall, probably about 10' thick. Outside the wall is a ditch about 20' broad, and beyond this a rampart of earth and stones, still 4' to 5' high. 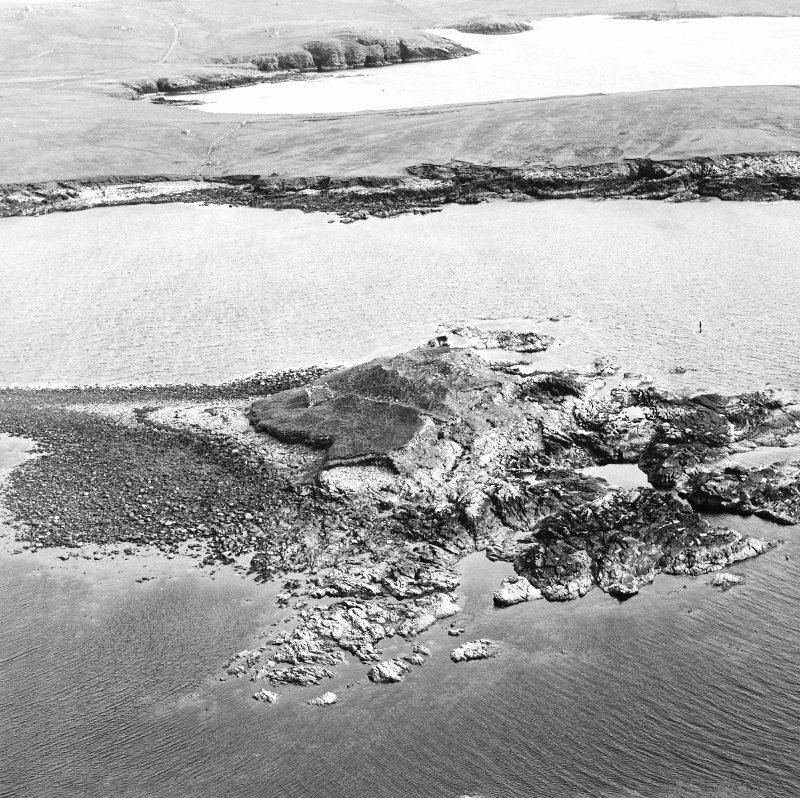 The structure has occupied practically the whole of the island, but there is no trace of any causeway to the shore. The waves have swept away quite two-thirds of the main building, along with the rocky face on which it stood. What is left is in ruinous condition, but the encircling outer rampart is still traceable from the NW to the ESE. 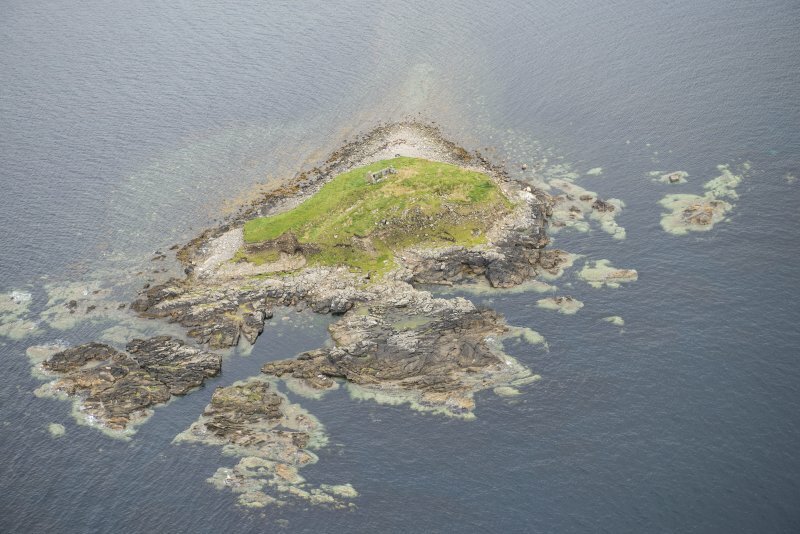 Spence states that 'The laird of Lund built a booth on the Holm with stones taken from the ancient walls, while hundreds of tons have been carried away as ballast by the fleet of haaf boats that fished from the Ayre of Mewgord. In its original from this must have been one of the most extensive of the brochs (Spence 1899). Irvine (nd.) 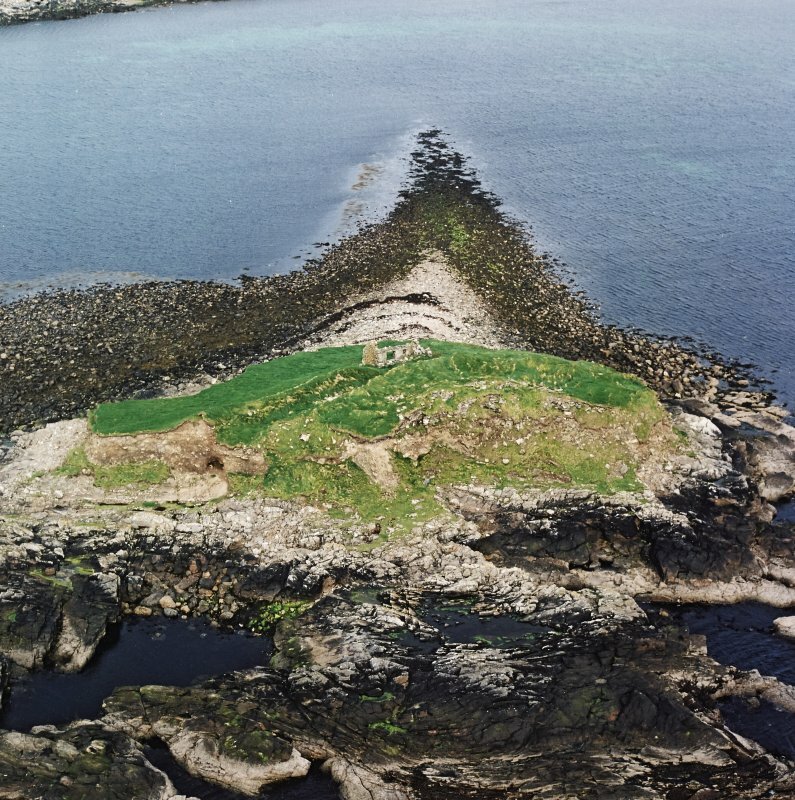 relates the tradition that the stones to build the broch were procured from a quarry on the west side of Valla Field, where the road track crosses from the east of the island, and that they were shipped at the Wick of Callaster and brought round to the Holm. Spence (1899) rejects this story and suggests a hollow known as 'Berg-grave' on the Brae of Newgord (HP 57 06 Breck of Newgorth) as a more likely quarry site. J Spence 1899; J T Irvine nd; RCAHMS 1946, visited 1930. 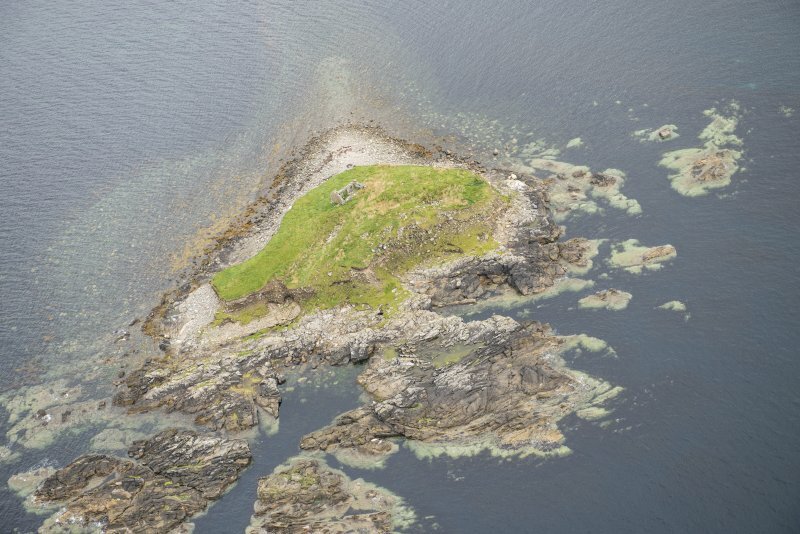 A broch, generally as described by RCAHMS. The outer bank has been truncated by a modern building. A break in the E side of the defensive wall may indicate an entrance but it is more likely to be later mutilation to facilitate robbing of the broch. There are indications of probable outbuildings between this wall and the broch and on the outside of the defences. Visited by OS (RL) 30 March 1969. 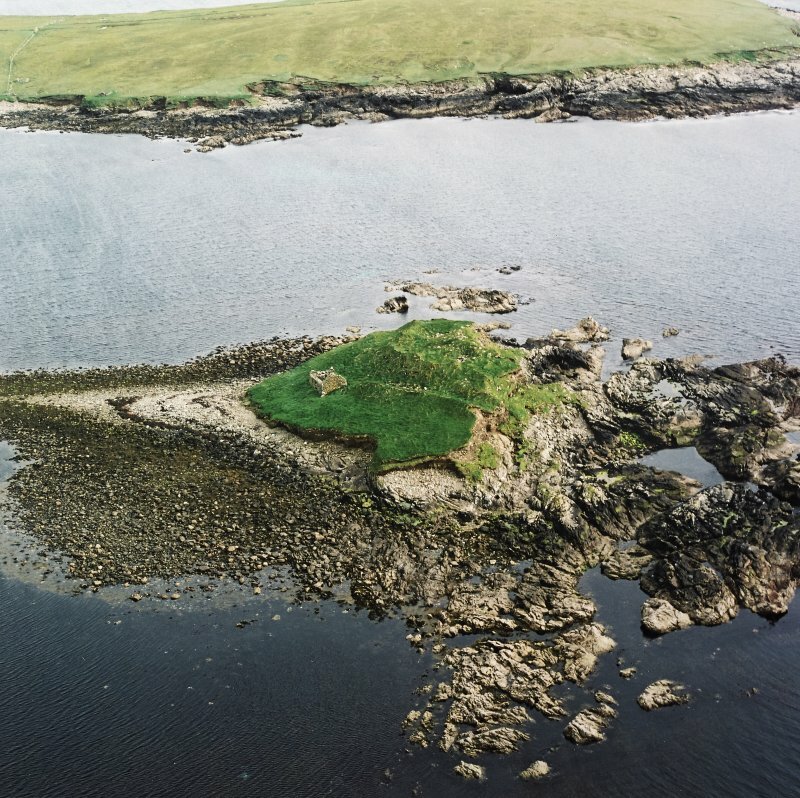 A probable broch on Unst occupying almost the whole of an islet off the coast, but with no trace of a causeway to the shore. It is "surrounded at a distance of about 21ft. by a massive defensive wall, probably about 10 ft. thick" and traceable from north-west to east-south-east. "Outside the wall is a ditch about 20 ft. broad, and beyond this a rampart of earth and stones, still 4 ft. to 5 ft. high" [1, 2]. 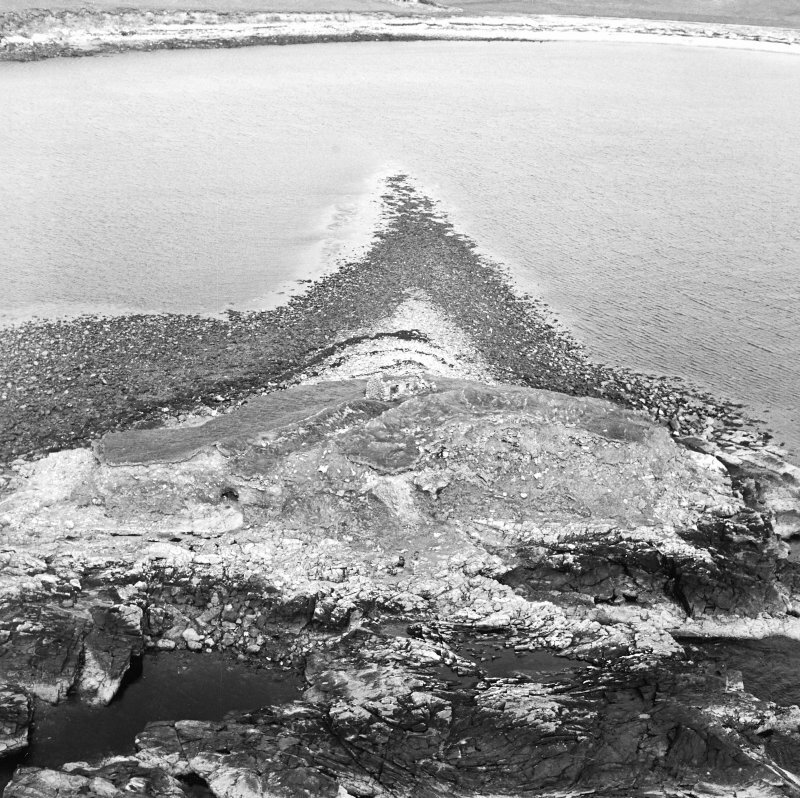 Erosion has removed about two-thirds of the main building and hundreds of tons of stones are reported to have been removed from the site for boat ballast . Sources:1. OS card HP50 NE 3: 2. RCAHMS 1946, vol. 3, no. 1548: 3. Spence 1899, 46-9: 4. Hibbert 1822, 398.